In 2018, TechnoServe worked in 29 countries across five regions of the world. This map shows our 2018 impact figures across each region. Just as investors seek the maximum financial return for their clients, TechnoServe works to turn every program dollar into the greatest possible income gains for our own clients: the people we work with in the developing world. TechnoServe’s projects achieved an average return on investment (ROI) of 3.3, or $3.30 in income gains for every $1 spent. 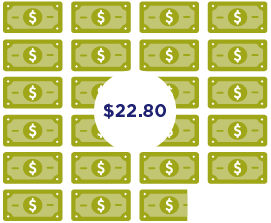 Across our portfolio, ROI scores range from 0 to 22.8. We use these figures to determine which programs are delivering the most value for money, and which need to be refined. We identify lessons learned from programs with higher ROIs and apply them to achieve greater cost-effectiveness in the future. This analysis also helps us understand patterns that indicate how to improve value-for-money at scale across our programs. 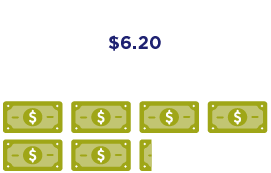 Average income gains for TechnoServe clients for every $1 of project cost. The projects on the following page demonstrate the range of our ROI and how we apply lessons from these figures. ‍This project built on the success of an earlier program, which developed a model for helping young people in Mumbai’s marginalized communities enter the white-collar workforce. After that program closed in 2016, this follow-on initiative scaled that model and closed in 2018 with an ROI of more than 20. ‍This cocoa program in Peru combined effective agronomic and market interventions to help participants earn over $6 of additional income for every program dollar spent. This approach informed the development of a new, larger program to support cocoa and coffee farmers across six Latin American countries. ‍This project achieved an ROI close to TechnoServe’s typical results. It trained coffee farmers in Rwanda on best agronomic techniques, with each participant gaining additional income equivalent to roughly a quarter of Rwanda’s annual GDP per capita at the time. These techniques were scaled up in the project’s next phase, resulting in an even greater ROI of 7.3. ‍This entrepreneurship program in West Africa increased many participants’ incomes but was relatively costly to implement. Based on this and other evidence, TechnoServe’s approach to supporting small businesses has shifted from business-plan competitions, like this one, to accelerator programs. ‍This program tested the best ways to encourage women’s mobile banking and piloted the use of digital learning tools. It also used a randomized control trial that added to its expense. As a result, its ROI was low—but it has yielded important learnings for future projects. Looking beyond the topline numbers and digging into the data helps us to better understand our impact: how it’s achieved, what it means for our clients, and how we can ensure that it grows. Most of TechnoServe’s beneficiaries are smallholder farmers in agricultural value chains, who see improved incomes as a result of higher yields, improved access to markets and inputs, and better prices. However, our work with micro, small, and medium-sized businesses has grown significantly in recent years, and these programs have also generated significant benefits for entrepreneurs, employees, and consumers. As TechnoServe and AB InBev worked to support sorghum and barley farmers in Uganda, a major drought struck the region. While farmers in a control group saw a resulting drop in their yields, farmers in this program had received specialized agronomy training, and maintained their productivity. These farmers increased their crop revenue by over 64 percent, compared to those in the control group. Cashew could be Benin’s biggest export if its full potential were met—especially by processing the nuts locally, which adds 50 percent to their value. Since TechnoServe’s BeninCaju project began working with farmers and processors in 2015, sales of locally processed cashews have increased over 450 percent, and are expected to grow even further in the next few years. In recent years, coffee farmers in Latin America have faced recurring outbreaks of leaf rust and other crop diseases, as well as a steep drop in global coffee prices. However, farmers who joined TechnoServe’s Better Coffee Harvest project starting in 2015—which provided them with agronomy training and market connections—made 56 percent more money from coffee last year than a sample group of similar farmers, who did not participate. As a result of working with TechnoServe in northern Nigeria, tomato farmers gained an average of $542 in additional annual income, equal to roughly a quarter of the country’s GDP per capita. This is enough to help participants to pay for a range of investments in the future, such as a small herd of goats or a year of secondary school for a child.